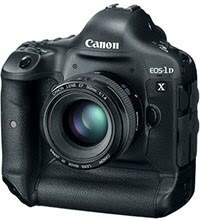 On top of the two updates for the older 1Ds III and 1D IV, I mentioned yesterday, Canon also updated the firmware for their flagship EOS-1D X camera. Improves the speed of the camera's acquisition of focus when using a Canon Speedlite's AF-assist beam. Reduces the time it takes to display the metering result on the LCD or Viewfinder when the meter has been activated. Fixes a phenomenon in which a "Caution 02" message is unnecessarily recorded in the camera status log. Fixes a phenomenon in which continuous shooting pauses when using a Canon Speedlite. Fixes a phenomenon, when the Canon GP-E1 is attached, in which the GPS device settings are reset to default settings when the camera has been powered off. * This phenomenon occurs only with firmware Version 1.2.1. * After changing the GPS device settings, please be sure to power off the camera before removing the battery. This will ensure that the camera's GPS device settings will be saved.